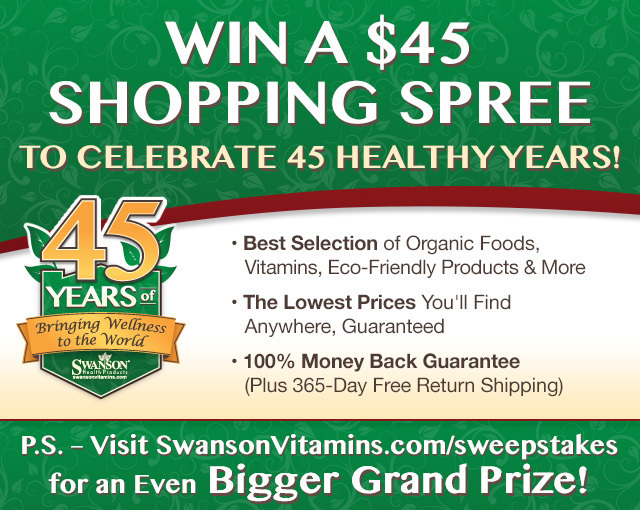 Swanson Health Products is celebrating their 45th Anniversary by giving one of my readers a chance to win a $45.00 shopping spree to spend on anything you would like at https://www.swansonvitamins.com/. I am a lifelong fan of Swanson Health products. I always find the best priced vitamins and supplements, plus top quality hair and skin care products, too! They even have pet care and organic foods. You just cannot beat Swanson Health when it comes to the biggest selection and most affordable prices of all of your health care needs. There are so many products to choose from and their prices are unbelievably low. You will get a lot for your money! I recently placed an order from Swanson Health Products for my sweet father, who is a diabetic and he was running short of some of his health supplements. He and I sat together and took our time on the Swanson Health website researching which vitamins and supplements that would be most beneficial to his condition. I loved how each product includes a detailed description of how it will help your body. We actually discovered a lot of helpful information and we each learned something new. My dad was able to order eleven bottles of supplements for under $45.00. Wow! And don't forget to visit SwansonVitamins.com/sweepstakes for an even Bigger Grand Prize! Disclaimer: I received samples o review and to keep. All opinions are my own. I have to have my omega 3 because I don't eat seafood I don't get enough from my diet even though I do try to eat as much as I can, I can only do so much. I take a multivitamin with iron. Since I stay anemic without it. I take Vitamin D3 every day. My important vitamin/supplement is fish oil (for Omegas). I talk a daily multi-vitamin. I always make sure to get my iron! Since I am pregnant, my prenatal vitamin is super important to me as well as my omegas and DHA. Thanks! I think my most important vitamin is Omega 3s. I really like Swanson's brand. I take iron supplements as my iron level tends to be below the normal range. The most important supplement I take everyday is a probiotic. I tend to have stomach issues so these really help. I do not have great bone density, so my calcium pill is the most important pill I take. I think the most important supplement I take each day is the Krill Oil. For my artery/vein hearth health. Right now, my most important vitamin is Calcium! We use a probiotic every day--very important to many aspects of good health. During periods of stress, we take a multivitamin with plenty of the B complex and C.
My most important vitamin I take each day is my women's daily multi-vitamin. Got to have it. I take a multi vitamin and probiotics. I take a multi vitamin daily. I'm a big kid at heart so I take gummy vitamins! I would say fermented cod liver oil. Mine is also my Omega's, I take a fish oil supplement and Krill Oil. So far Vitamin D would be the only one. I just take a multivitamin everyday. The most important vitamin that I take every day is Vitamin D3. I was having pain in both forearms and a lot less energy before discovering I was extremely deficient. Starting taking it daily on a doctor's advise and I'm amazingly better now! It helps your immune system and bones, very important as we age!